I’ve eaten Fried Asparagus several times in the past year as an appetizer. I was surprised when I saw a recipe in a hundred-year-old church cookbook for Fried Asparagus. It apparently has been around for a long time. 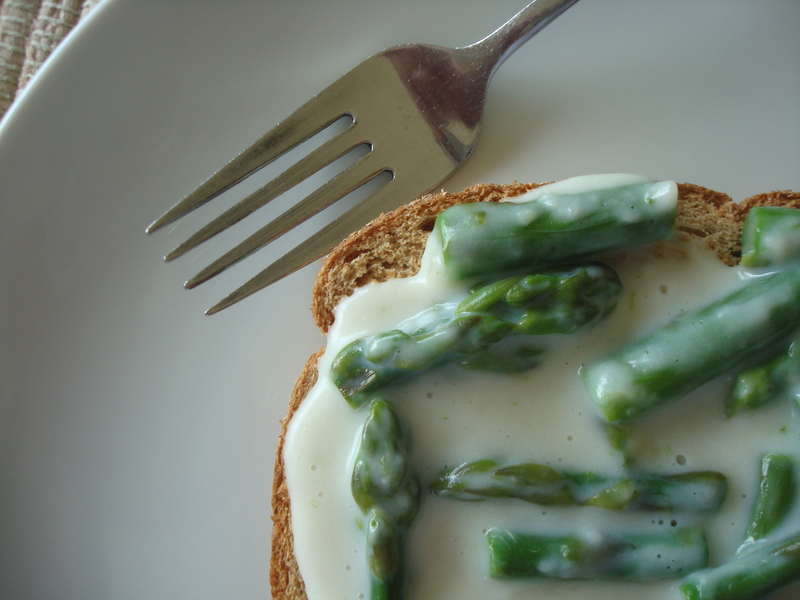 The crisp lightly-browned breading on the asparagus creates an enchanting appetizer or side dish. The original recipe says, “This is nice and easy to prepare.” I concur. This is a fun and easy recipe. Bring water to a boil in a large saucepan. Meanwhile wash and trim the asparagus spears, then blanch them by adding to the boiling water. Cook for 2-3 minutes or until al dente. Remove the asparagus from the water and immediately put the spears in ice water to stop the cooking. Prepare a batter by combining the flour, salt, eggs, and milk in a mixing bowl. Beat until combined. 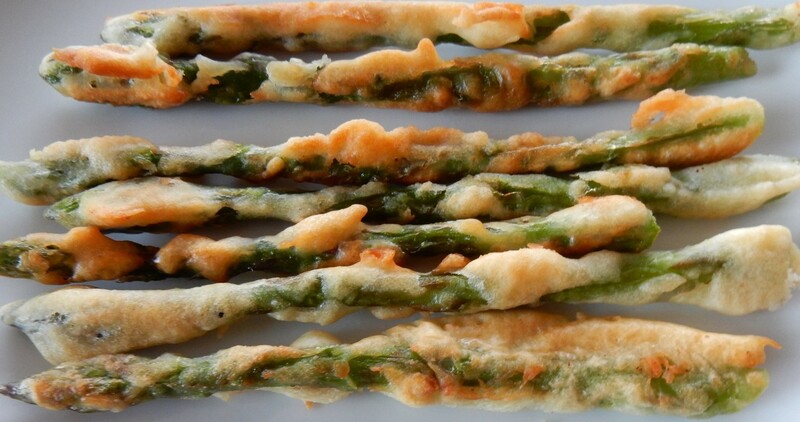 Roll the blanched asparagus in the breading batter. Heat 1/2 inch of shortening or oil in a large frying pan. Carefully place the breaded asparagus spears in the pan in a single layer. Depending upon pan size, the spears may need to be cooked in several batches. Fry for about a minute or until the bottom side of the asparagus is lightly browned, then gently turn and fry until the other side is browned. Remove from pan and drain the asparagus on paper towels. Serve immediately. The original recipe is lacking in details. It tells the cook to dip the asparagus in batter, but fails to tell them how to prepare the batter. Apparently the recipe author assumed that every cook already knew how to prepare batter. Since I didn’t know how off the top of my head, I decided to adapt an old recipe that I’d previously used to make fritters to make a batter that would work with the asparagus. As the seasons transition from winter to spring, the foods are ever evolving. Spinach, green onions, and eggs are wonderful quintessential Spring foods. 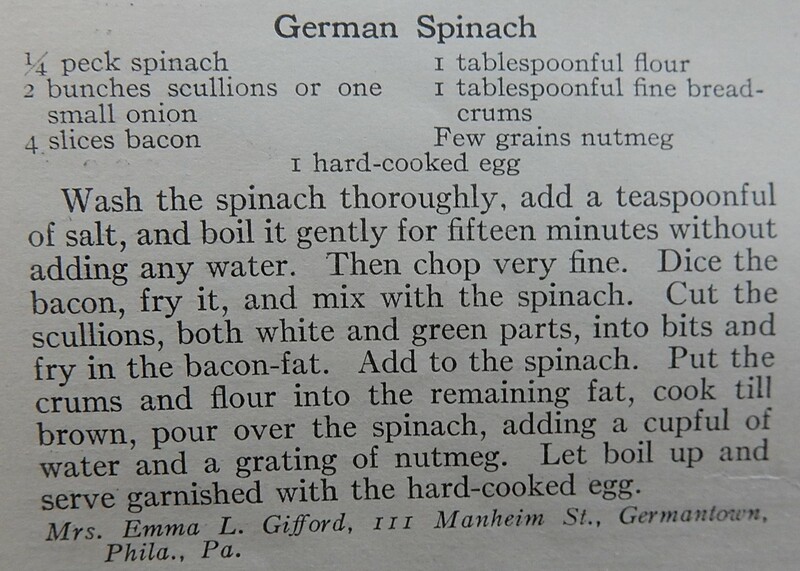 I was thrilled to find a recipe for German Spinach in the April, 1916 issue of Good Housekeeping that calls for all three. 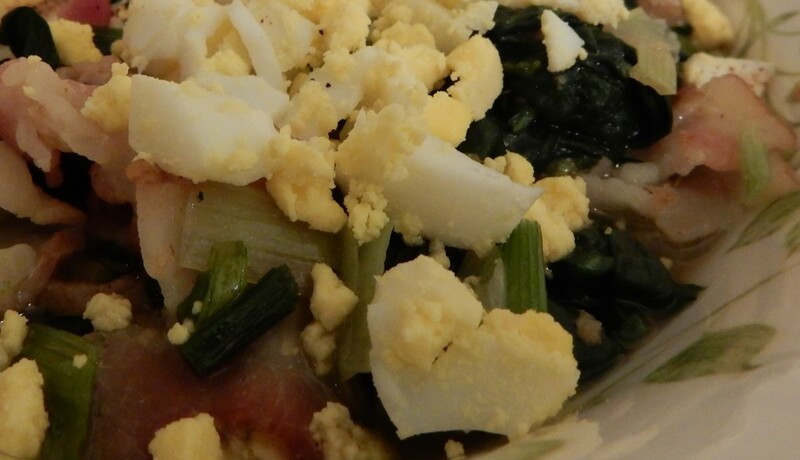 The spinach and green onions, combined with bacon and a lovely chopped egg garnish, creates a stunning seasonal dish. Wash spinach, then put into a large saucepan with just the water that is clinging to the leaves. Using medium heat, cook spinach until wilted while stirring occasionally. In the meantime, chop the white and green parts of the green onions. Put the bacon in a skillet and using medium heat, cook the bacon for several minutes. Add green onions, and continue frying until the green onions are wilted. 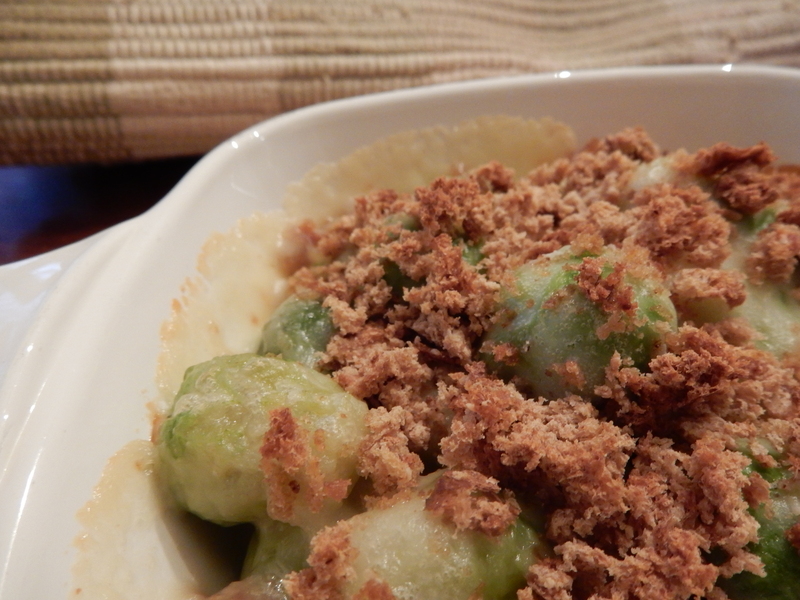 Stir in the flour, bread crumbs, and nutmeg; then add the cooked spinach. Put into serving dish and garnish with the egg. If desired, sprinkle a little nutmeg on top. The old recipe called for adding water to the spinach and bacon mixture, then cooking until the water is “boiled up.” When I made this recipoe, I didn’t add any additional water since it didn’t seem needed. Without the added water, the dish was ready to put in a serving bowl as soon as the bacon mixture and the spinach were combined. Winter farmers’ markets in the small suburb where I live are always a bit of an adventure, and I’m never quite sure what will be available. I recently was thrilled to find some lovely parsnips, but then I had a challenge: Could I find an interesting hundred-year-old recipe that called for parsnips? 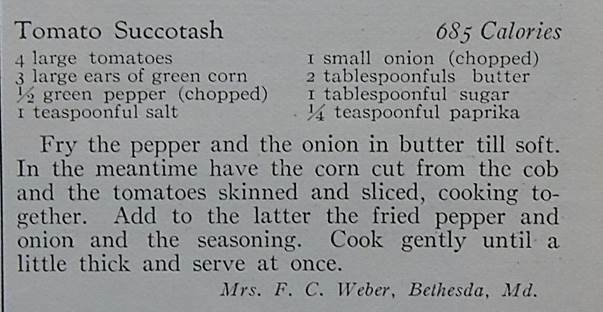 I browsed through a couple 1916 issues of Good Housekeeping magazine and came across an intriguing recipe for Parsnip Balls, and decided to give it a try. The Parsnip Balls only had a few ingredients and were surprisingly easy to make. They turned out awesomely. 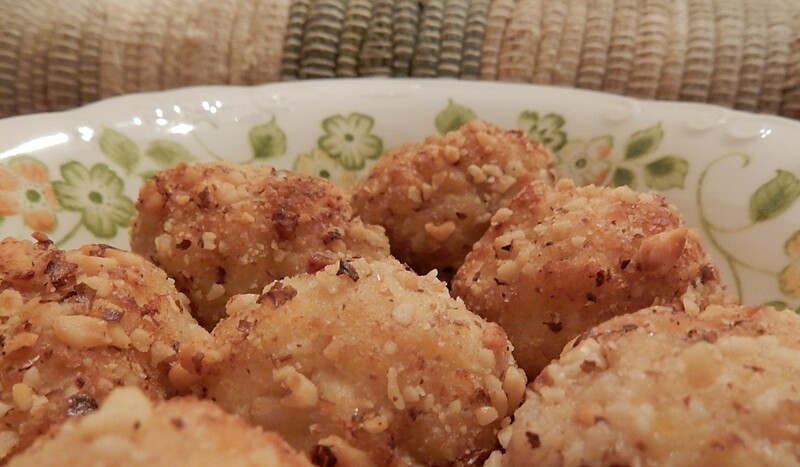 The balls were coated with ground walnuts which added a bit of crunch to the earthy, sweetness of the parsnips. This recipe is a keeper. Peel parsnips and cut into 1/2 inch cubes. Place cubed parsnips in a medium saucepan and cover with water. Using high heat bring to a boil, then reduce heat and simmer until parsnips are tender. Drain parsnips, and then mash. In the meantime, crush the saltine crackers to make crumbs. Combine mashed parsnip, cracker crumbs, egg yolk, and salt in a bowl. Shape the mixture into 1-inch balls; then roll in ground walnuts. Place the shortening into a frying pan, and heat until hot. Drop balls into the hot shortening, then gently roll the balls with a fork until all sides are a light brown. Remove from heat and drain on paper towels. The farmer’s market has oodles of awesome squash—butternut, hubbard, acorn, and lots of other wonderful varieties whose names I don’t know. It’s time to make Honey-Glazed Squash. This old-time recipe contains not only honey, but also lemon juice and ground mace. The lemon juice gives lovely citrus undertones to the honey which mingles with the delicate flavor of the mace. 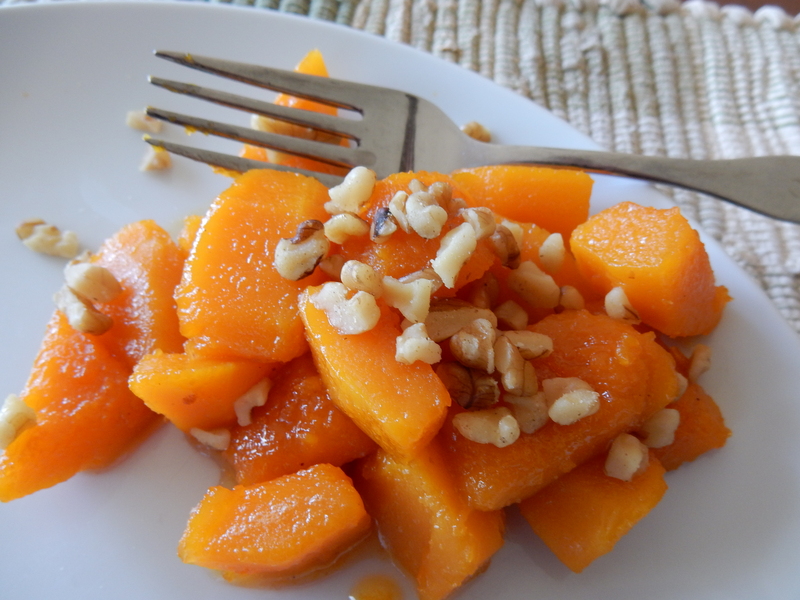 If desired, chopped walnuts can be mixed with the squash for added flavor and crunchiness. If you are looking for a recipe for candied, squash, this IS NOT the recipe for you. But if you want a classic recipe for a rich, but sophisticated glaze, that is unexpectedly flavorful, you’ll love it. Put cubed squash in a saucepan and cover with water. Turn heat to high and bring to a boil; reduce heat to medium and cook until just barely tender (about 12-15 minutes); then thoroughly drain the squash. Meanwhile in another pan, melt the butter; then stir in the honey, lemon juice, and mace. Using medium heat bring to a boil, then reduce heat so that the liquid simmers. Cook until the liquid begins to thicken into a honey syrup (about 8-10 minutes). If desired, add the walnuts. Add the drained squash cubes to the syrup, and gently turn the cubes to coat with the honey glaze. Place glazed squash in a serving bowl. 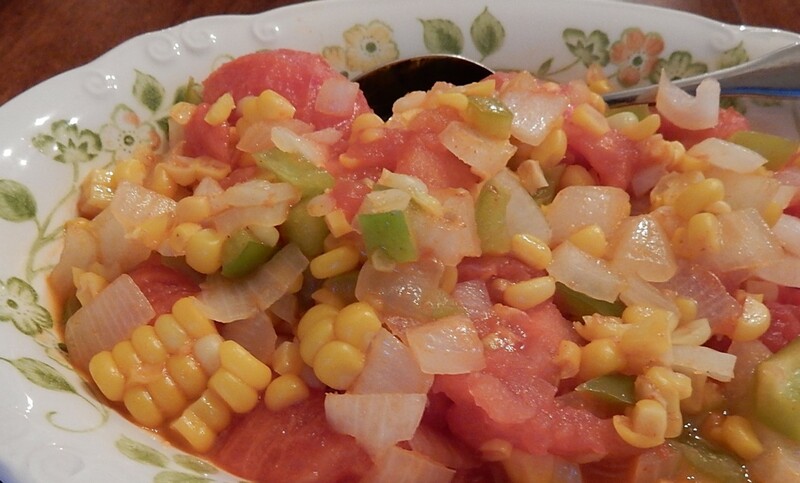 Any type of winter squash can be used for this recipe, but here is the squash that I used. Can you help me identify it? It cooked up beautifully–the cooked pieces were tender, but retained their shape well. At the farmer’s market, it was in a group of squash—all which had long crooked necks—that were labeled as butternut squash. However, the butternut squash every other producer was selling had much shorter necks. This squash probably weighed about 5 or 6 pounds. I have a very vague memory of a squash called the Pennsylvania Dutch crookneck squash that we grew when I was I child which I think looked similar to this. But this squash was smaller than what I remember them being. So I’m confused. 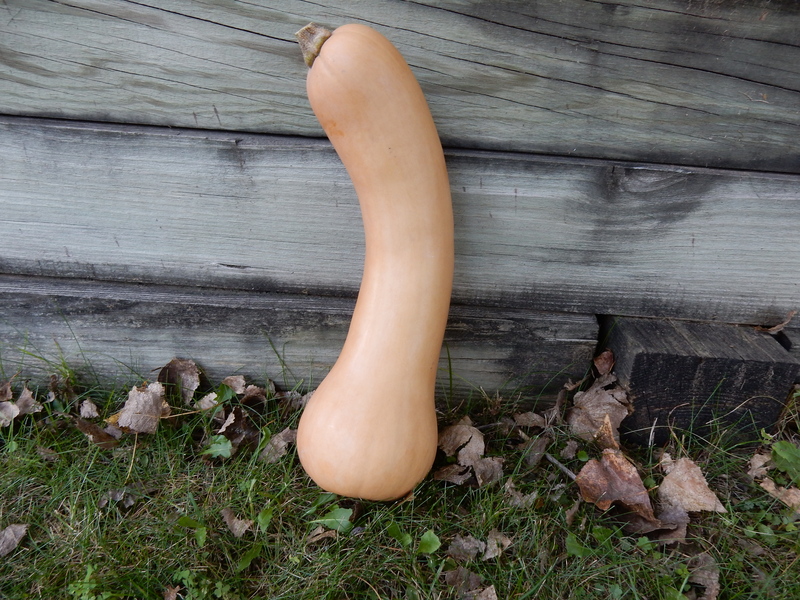 Is it a butternut squash? . . . Pennsylvania Dutch crookneck squash? . . . something else? Monday, May 12, 1913: No important events to record. Did Grandma do any “unimportant” things a hundred years ago today? Did she help her mother with the cooking? If so, did they eat asparagus or any other fresh, seasonal vegetables? Yesterday I bought some asparagus at the store. It was good, but not as tasty as the wild asparagus that I remember finding in fence rows when I was a small child. We often only found a few tender shoots, and to make the delicacy go further, we’d cream it and serve it on toast. Put asparagus into small saucepan; cover with water; bring to a boil and simmer for 2-3 minutes. Remove from heat and drain. In a frying pan, melt butter. Stir the flour into the butter. While stirring constantly, slowly pour in milk and bring to a boil over medium heat. If mixture is too thick, add a little more milk. Gently add the asparagus and bring back to a boil; remove from heat. Serve over toast. An aside—Does anyone remember the book by Euell Gibbons called Stalking the Wild Asparagus? The author lived in central Pennsylvania when I was a teen, and— though I never met him—it seemed exciting to have a minor celebrity living in the general area.